Add 2 level scoops (64 g) to 12-16 oz. of cold water, milk, or your favorite juice and blend. Also consider adding NOW Flax Seed Oil for enhanced nutritional benefit. Please note the additional calories and nutrients provided by the above ingredients. Other Ingredients: Cross-Flow Microfiltered Whey Protein Isolate (providing ß-lactoglobulin, a-lactalbumin, Immunoglobulins and Glyomacro Peptides), Fructose, Natural Flavors, Xanthan Gum, Lecithin and Stevia rebaudiana Herbal Extract. 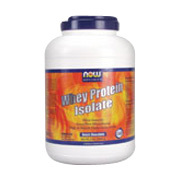 Chocolate Whey Protein Isolate is shipped in a discrete, unmarked package. Orders are processed immediately and usually take about 3 to 5 working days to be received. We do ask that you try it for 2 to 3 weeks to feel the full effects. Any information received is used only for order processing and shipping purposes. Your information, such as e-mail address, will never be disclosed to a third party.